Among the most significant notions of systems thinking are the interaction of the whole and its parts and the emergent properties that are observable in a holistic structure which cannot be reduced to its components. Such notions are fully compatible with the theoretical views of cognitive linguistics, which assumes language as an integrated system of general cognitive abilities. In particular, the usage-based model of cognitive linguistics is a synthesis of categorization and abstraction from actual usages, involving both bottom-up and top-down organizations. The validity of the usage-based account for language acquisition will support a systemic approach to language development, which is further located appropriately in the scientific paradigm of complexity theory as suggested by Larsen-Freeman (Complexity theory: the lessons continue. 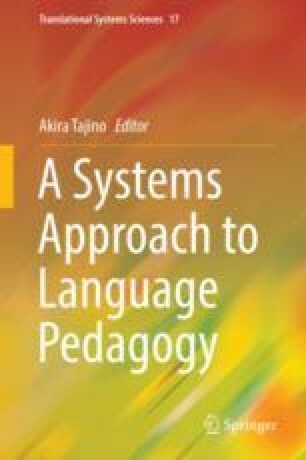 In: Ortega L, Han Z (eds) Complexity theory and language development. John Benjamins, Amsterdam/Philadelphia, pp 11–50, 2017).